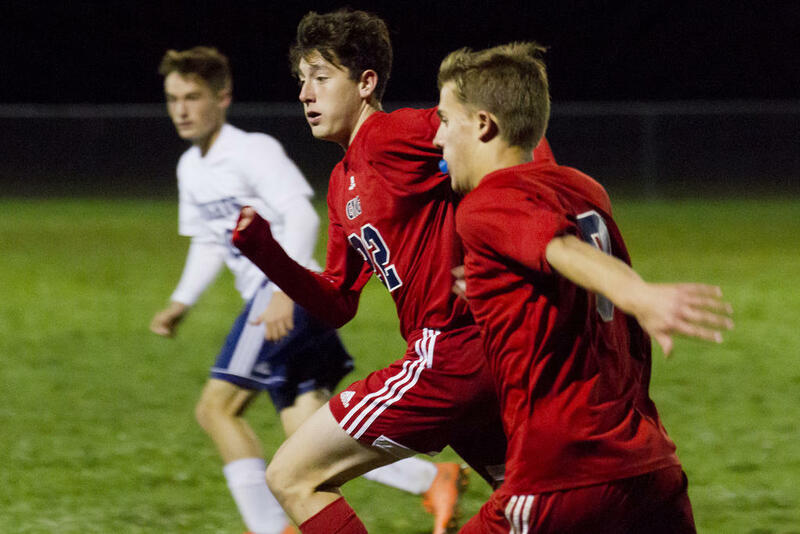 GRAY—The Patriots picked up a 1-0, senior-night victory vs. visiting Poland on Saturday, Oct. 13: Andrew LaCerda powered home the game’s lone tally late in the first half, after which G-NG held on for the W.
The first-half action bounced up and down the field a bit, though G-NG clearly held an edge, keeping the Knights mostly pinned in their half of the field and pressuring consistently. Whatever pushing back the Knights managed to do against the Patriots’ offense, they failed to convert on – in fact, they couldn’t even generate any quality opportunities. G-NG, on the other hand, logged several good chances as the uphill stretch unfolded. 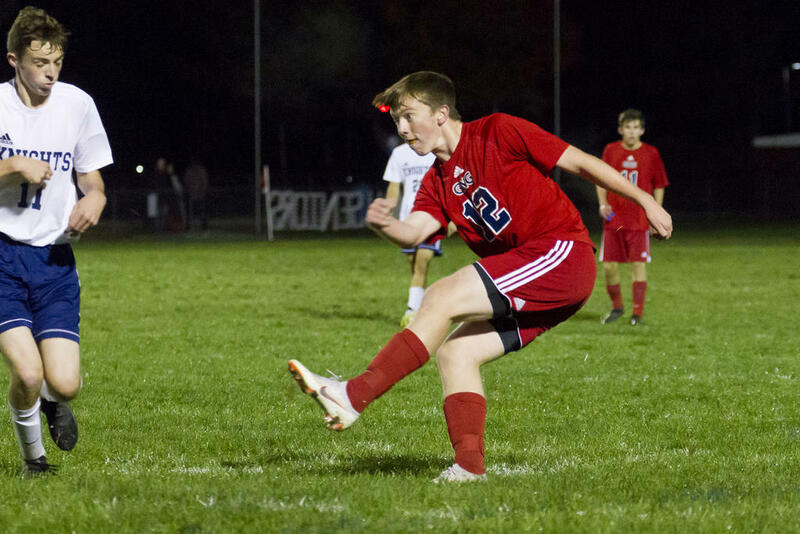 Patriot Jake Kackmeister, for instance, turned in two great shots in the 24th minute, the first a header that hit the Poland crossbar and the second a redirect that sailed just high. Both came on corners. 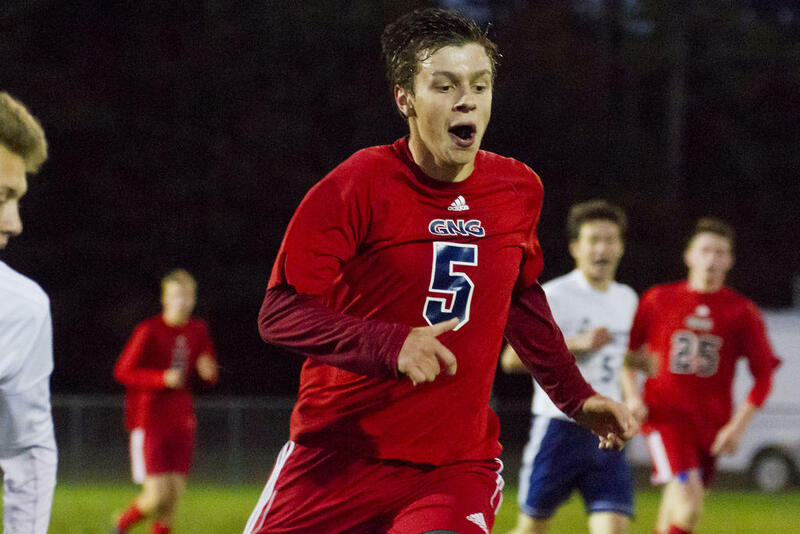 Finally, in the 27th minute – at 12:45, to be exact – Patriot Hunter Brown belted a ball from the Knights’ left corner centerward. 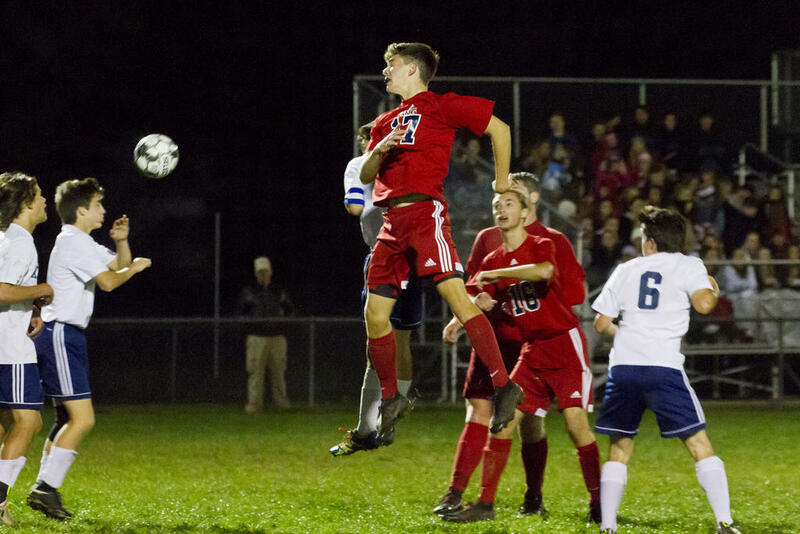 LaCerda reeled in the ball maybe 20 yards out from the goal, settled it, turned and kicked: The shot found its way past Poland keeper Davin Cloutier for 1-0. The last 52 minutes saw no goals scored. 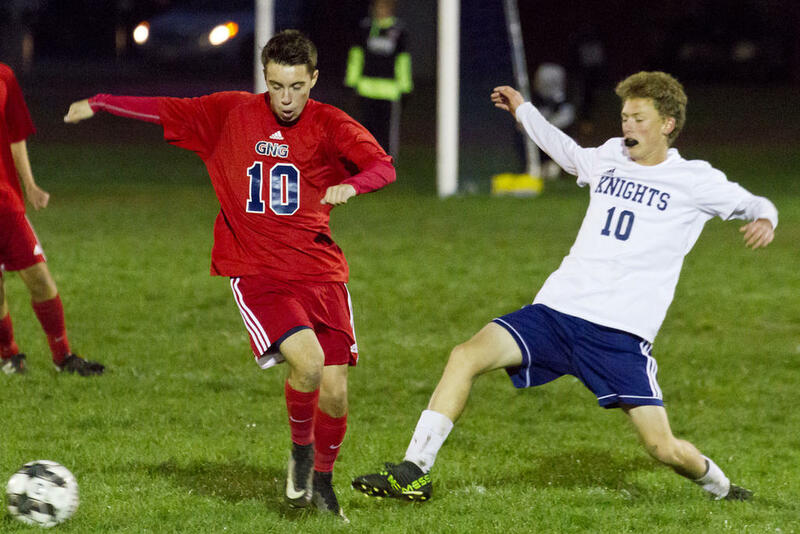 G-NG might’ve wanted them – the Knights certainly did – but neither side could notch them. No doubt conditions were far below ideal; heavy rain earlier in the day had left the field slick. Players clearly found it difficult to maintain their footing at times – at times, they looked like they might as well have been competing on an ice rink. 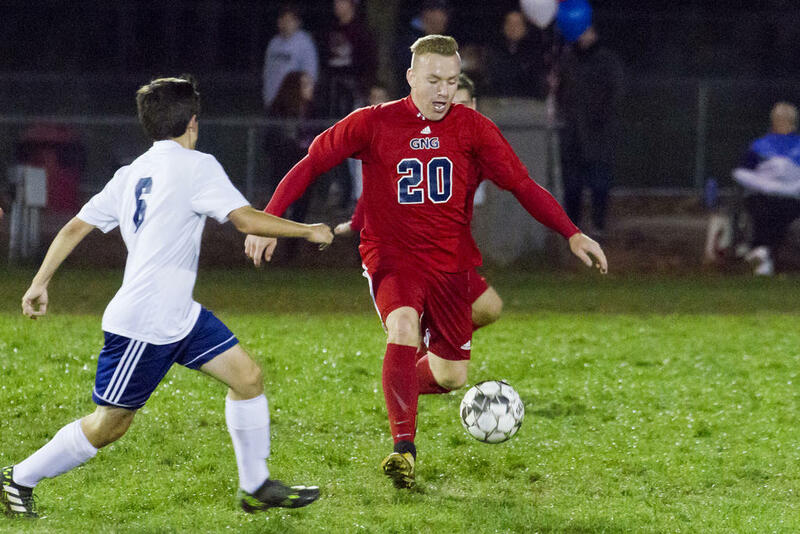 The win bumped G-NG to 6-5-2 on the autumn; the Patriots slipped to 6-6-2 on Monday, the 15th, however, when they fell 1-0 at No. 3 Greely (8-4-2). Still, the team sits 11th in the standings – just inside the bracketing – where they are secure, as all regular-season games have now been played. It appears their prelims bout will be on the road at sixth-ranked Mountain Valley (7-6-1). The two teams have not yet met this year. Logan True (22) tracks the play up the sideline. Lawson Dunford clashes with a Poland opponent. Alec Brooks unwinds into a kick. Kyle Martell vies with a Knight. 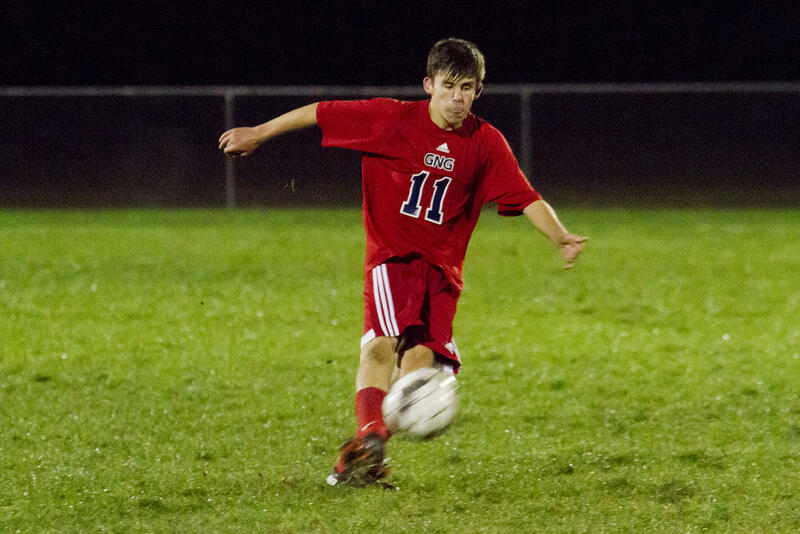 G-NG’s Jake MacCallum heads a ball toward the Poland net. 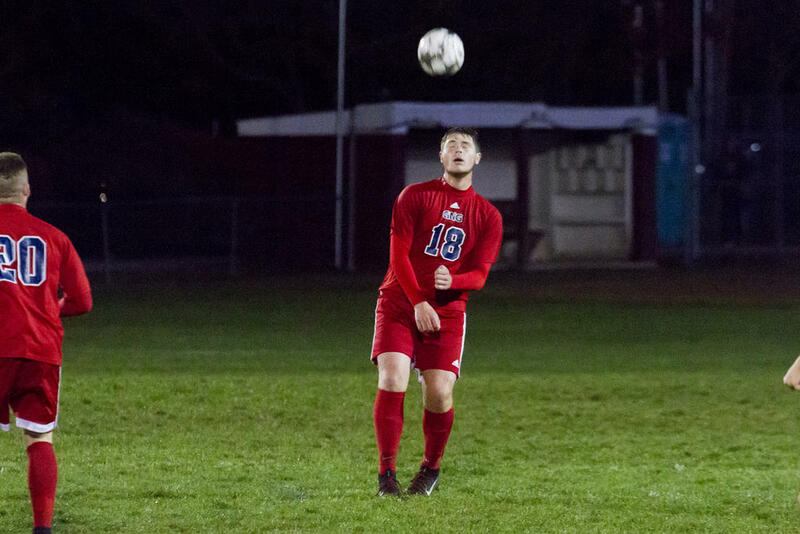 Andrew LaCerda sends a ball centerward. 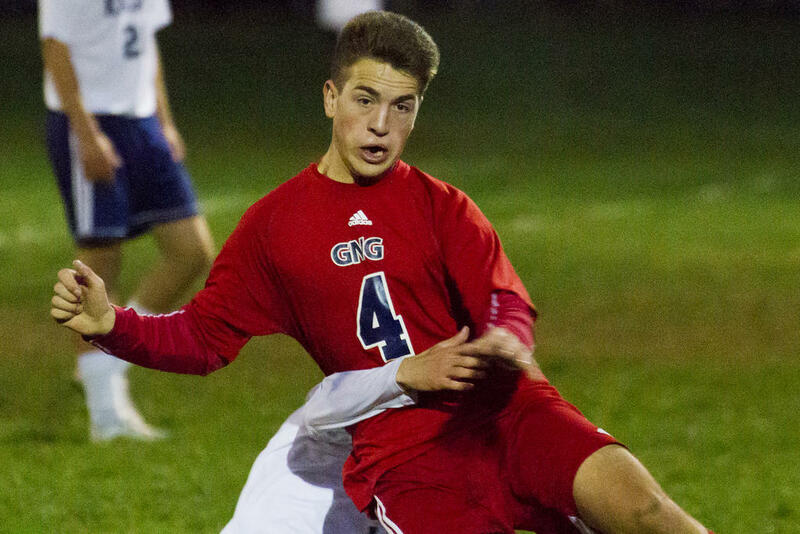 LaCerda scored the game’s only goal, securing a G-NG victory. 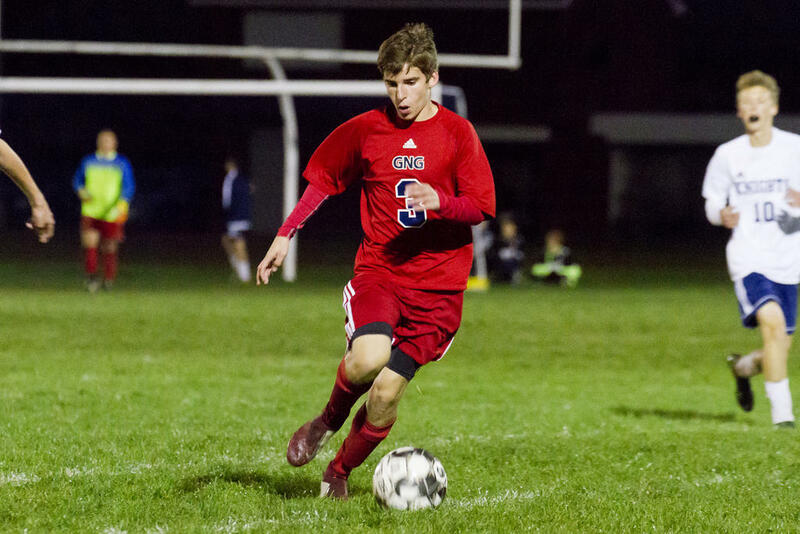 G-NG’s Keegan Brooks cuts forward, into the corner, on the attack. G-NG’s Nick McCann wars in the midfield. 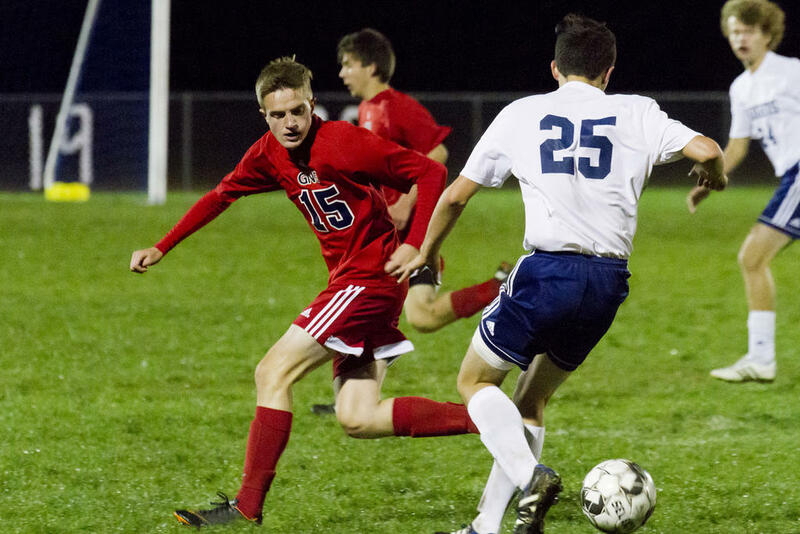 Jake Kackmeister heads a ball for the Patriots. 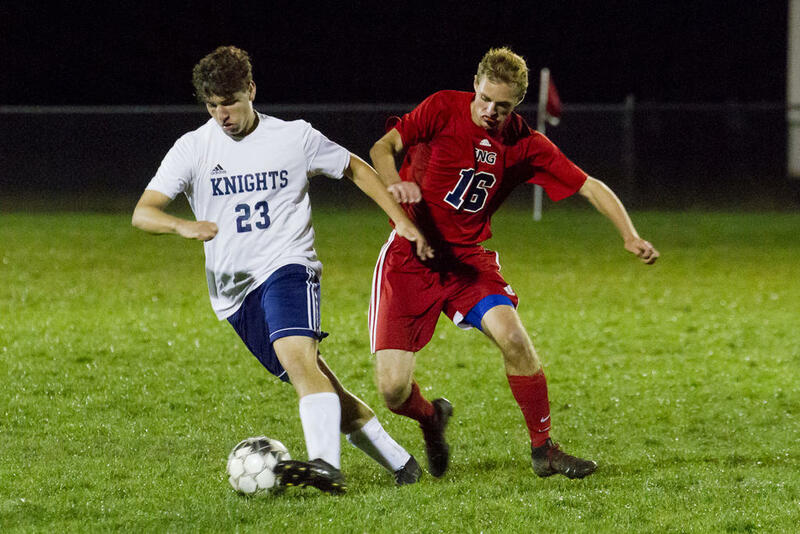 Tristan Fogg battles a Knights opponent. Kyle Mercier–tangled up with a Poland opponent–tumbles to the slippery grass. Mike Sutherland cruises upfield for the Patriots.